The militant group Harakat al-Shabaab Mujahideen (al-Shabaab) has once again made international news headlines, this time with two deadly attacks carried out on May 24 on the Somali Parliament building in Mogadishu and La Chaumiere restaurant in Djibouti. News reports suggested over a dozen people were killed, including the attackers in each incident. These attacks have prompted renewed scrutiny of al-Shabaab’s current status, its strategy, and its principal tactics and procedures, and two narratives have emerged. One describes a resurgent al-Shabaab that is now unified, transnational, and is readily able to exploit weaknesses in the African Union Mission in Somalia (AMISOM) and Somali Federal authorities. The other narrative suggests al-Shabaab’s fortunes are at an all-time low, its reinvention was forced by necessity, and its levels of popular support in Somalia are diminishing daily. Al-Shabaab is thus currently fighting to survive and has become more desperate. Early indications from AMISOM’s latest series of offensive operations, Operation Eagle, suggest that while the second narrative is more persuasive, al-Shabaab remains an active and potent enemy that will focus on exploiting weaknesses within AMISOM and the Somali authorities. It is these weaknesses that need to be remedied to keep al-Shabaab on the back foot. Al-Shabaab’s leaders suggest that, since mid-2013, after a period of internal turmoil, a new consensus has been forged about the movement’s ideology, strategy, and tactics, and power has been consolidated under its Emir Ahmed “Mukhtar Abu al-Zubayr” Godane. Godane’s key move came in late June 2013 with a purge of al-Shabaab’s leadership. He ordered the execution of several top commanders, including two of the movement’s co-founders, the arrest of over a dozen other senior figures in Barawe, one of al-Shabaab’s remaining strongholds 250km south of Mogadishu, and reportedly had killed some 200 members of the Amniyat (“secret service”) network. Other top leaders fled for their lives, including Mukhtar Robow and Sheikh Hassan Dahir Aweys, both of whom reportedly ended up in Somali government custody. The targeted senior figures had previously accused Godane of a brutal and un-Islamic style of leadership and of destroying al-Shabaab’s shura. This new al-Shabaab is smaller and controls considerably less territory than just a few years ago, but it retains more than enough fighters and ground to finance and organize its terror attacks–some $25 million per year. It also continues to exploit clan divisions within Somalia as well as local concerns about the growing role of Kenyan and Ethiopian troops in the country. Its infiltration of the Somali Federal Government and its security forces also persists. Moreover, al-Shabaab recruits throughout east Africa and taps into global jihadi networks to expand the war beyond Somalia, particularly to AMISOM’s troop-contributing countries and their principal supporters, the US and Britain. In sum, this narrative paints a picture of a resurgent al-Shabaab that is now unified, transnational, and has willingly traded territory for potency. It contains a degree of truth inasmuch as al-Shabaab remains a deadly opponent. It has conducted regular attacks on high-profile targets including the Mogadishu courthouse (April 14, 2013), the UN compound (June 19, 2013), the Turkish embassy (July 27, 2013), the Westgate Mall in Nairobi (September 21, 2013), near the National Security Agency headquarters (February 27, 2014), Villa Somalia (February 21, 2014), and the Somali Parliament building (May 24, 2014). Estimates credit al-Shabaab with approximately 15 attacks per month between October 2012 (after Kenyan and allied militia forces took control of Kismayo) and February 2014, killing, on average, over 40 people each month. Another source estimated that between October 2012 and March 2013, the number of security incidents attributed to al-Shabaab within south-central Somalia averaged 61.7 per month or nearly 2 per day. Most of these were ambushes on AMISOM’s supply routes or IED/grenade attacks and assassinations in urban areas, notably Mogadishu. More recently, al-Shabaab has attacked key symbolic targets using both suicide bombers and suicide infantry. In short, al-Shabaab retains enough capabilities, and the intent to consistently employ terror tactics both within Somalia and beyond. It is also worth noting that al-Shabaab has a track record of increasing its attacks during the month of Ramadan. An alternative interpretation of al-Shabaab suggests its reinvention was forced by necessity. Furthermore, its extremist policies have seen its level of popular support decline to such a degree that it has probably entered the beginning of its political endgame. As Matt Bryden put it, “Al-Shabaab’s steep decline in recent years has made radical reform a matter of survival.” Nor does al-Shabaab any longer pose a strategic threat to the Somali authorities as it did between 2007 and 2010. Al-Shabaab’s political decline stems from several interrelated factors. First is its inability to use decisive conventional military force. After its failed Ramadan offensives against AMISOM and Somali transitional government forces in Mogadishu in 2009 and especially 2010, al-Shabaab leaders realized that they could not defeat their opponents through conventional military means, prompting the shift in tactics identified above. A second, and related factor, was al-Shabaab’s loss of support from within key clan constituencies. A significant turning point came after al-Shabaab’s failed Ramadan offensive of 2010 when the majority of casualties were borne by Rahanweyn militia. Sheikh Mukhtar Robow responded to subsequent clan pressure and pulled his Rahanweyn fighters out of Mogadishu. The tensions between Robow and Godane resurfaced in 2011 with arguments over whether to allow UN relief agencies to operate in al-Shabaab-controlled areas of south-central Somalia. Because many of his clan territories were badly affected, Robow was willing, whereas Godane eventually banned such organizations, apparently concerned that they might provide intelligence for Western military strikes. The effect was a more devastating famine–which killed some 260,000 people–and increased local resentment against al-Shabaab. A third source of al-Shabaab’s weakness was its increasingly extreme ideology that suggested Somali civilians were legitimate targets of its attacks and that the movement should appeal more directly to extreme al-Qaeda affiliates beyond Somalia. One particularly infamous case occurred in December 2009 when a suicide bomber who had travelled to Somalia from Denmark killed 23 onlookers and medical students at a graduation ceremony. Although some members of al-Shabaab tried to disown this attack, crowds spilled onto the streets of Mogadishu to burn al-Shabaab’s black flag. The fourth major factor forcing al-Shabaab’s reinvention was the military pressure it endured from AMISOM, and, to a lesser extent, the Somali security forces. After defeating al-Shabaab’s Ramadan offensive of 2010, in early 2011 AMISOM forces went on the offensive, and by early August al-Shabaab withdrew its fighters from central Mogadishu. With a unilateral intervention by Kenyan forces in southern Somalia in October 2011, and additional troops from Ethiopia arriving the following month further north, al-Shabaab lost a series of settlements in late 2011 and early 2012. Kenyan forces, supported by a variety of local militias, seized the strategic port city of Kismayo in late September 2012. After more than a year of stalemate, in November 2013 the enhancement of AMISOM as part of UN Security Council resolution 2124 led to more than 4,000 Ethiopian soldiers joining the AU mission in January 2014. This prompted a series of offensive operations–know as Operation Eagle–which by April had captured another ten towns from al-Shabaab. In response, al-Shabaab forces stationed in these settlements usually retreated. As they withdrew, they often destroyed wells and coerced some of the local populations into leaving, too. Rather than defend these urban areas, al-Shabaab preferred to retreat to the countryside and subsequently infiltrate the towns to conduct its preferred type of asymmetric–often IED–attack. Specifically, al-Shabaab reverted to trying to spread AMISOM/Somali government forces thin, attacking their weaker positions and supply lines, and threatening local populations in these settlements not to collaborate with them. Al-Shabaab has also subsequently blockaded relief supplies into some of these settlements. 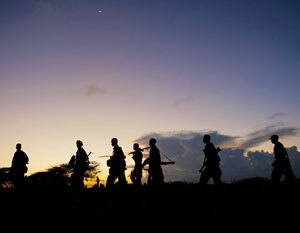 AMISOM’s operations were hampered by some familiar problems. Once again, they suffered from a lack of force enablers and multipliers, particularly aviation assets and armored personnel carriers; also, their lack of maritime assets allows al-Shabaab to continue to utilize the coastline in areas such as Cadale. AMISOM also struggled to obtain good intelligence on al-Shabaab. Logistical challenges were also apparent, in part because of the poor state of the roads, which made AMISOM’s supply routes vulnerable. It was also notable that one of al-Shabaab’s propaganda tools–Radio al-Andalus–was not jammed or disabled. Despite all these operational challenges, Operation Eagle has given AMISOM and the Somali authorities an opportunity to capitalize on al-Shabaab’s weaknesses. To do so, they now need to deliver services and effective governance to the newly captured settlements as a matter of urgency. Hence, although AMISOM and the Somali government may not be able to defeat al-Shabaab, this should not necessarily be interpreted to mean that they are facing a resurgent enemy. Paul D. Williams is an Associate Professor in the Elliott School of International Affairs at the George Washington University.